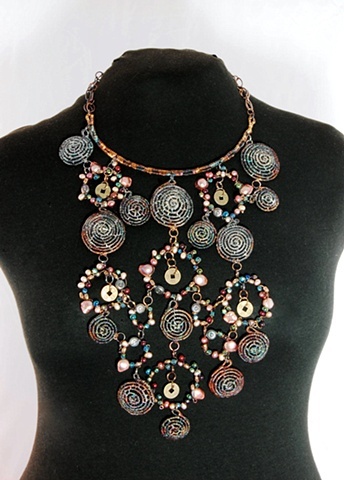 This unique, tribal-inspired neckpiece is constructed of fourteen individual coiled baskets made of fine silver around a copper wire core. Between the baskets are circular rings of acorn pearls, brass coins, and freshwater pearls in shades of wine, green, and blue. The center base unit, from which the baskets hang, is also coiled. Double rows of chain extend from both sides of the base unit. The back is finished with a sterling silver toggle clasp. The individual parts of this necklace were patinated in liver of sulfur to bring out the vibrant hues.